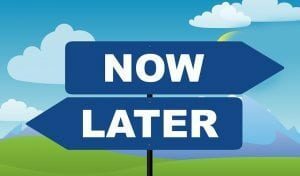 Home » Blog » Health & Nutrition » Procrastination May Be Hardwired into Your Brain: But Here’s 3 Tips! Are you putting off until tomorrow what you could be doing today? If that’s you, it might not be just a personality trait. A study of over 250 men’s and women’s brain scans revealed that a brain region involved in motivation tends to be larger among people who put things off, while communication between that part of the brain and another involved in taking action appeared to be weaker. This study is the first to scan the brain to identify a neural basis for procrastination. Participants in the study were between the ages of 18 and 35 with no history of neurological or psychiatric disorders. Each completed a survey to assess their inclination towards completing tasks versus putting them off. Then each had a series of MRI scans. The study found that procrastinators tended to have a weaker connection between the amygdala, a section of the brain that rules emotions, and a brain area known as the dorsal anterior cingulate cortex, (dACC), a brain region that promotes mental action and motor control. While interesting, these findings don’t support any conclusions about whether or not a procrastinator can change their behavior. More research will be needed to understand brain dynamics before considering any solutions. Tackle the hardest tasks first. It is in the procastinator’s nature to put off the hard jobs. By doing the hard jobs first, you’ll find it easier to tackle the easy tasks and feel a sense of accomplishment for the rest of the day. Aim for complete over perfect. If you feel like your job must be perfect, you may be setting yourself up for procrastination. Sometimes a job doesn’t need to be perfect, just complete. Remember not to sweat the small stuff. Reward yourself for a job well done. If you give yourself an incentive to complete your task, your much more likely to complete it. For example, maybe you want to go the local coffee spot with your colleagues at 10. Just tell yourself that when your task is complete, you get to celebrate with a coffee run with your friends. The key to success here is to hold yourself accountable and finish the task or forego the reward.